It’s September, and here in Ithaca the leaves have already begun to turn yellow. We’ve got a wonderful set of new members to introduce to you, after a record-shattering number of students (183 total!) auditioned for the Cornell Choirs. First off, I’d like to update you on all the work put into recruitment efforts this summer. Nataša Kostić ’18, our Publicity Manager, created a beautiful overview video of our Treble Conference from March. Marta Faulkner ’20 was responsible for another, geared more specifically toward recruitment. Chiara Alvisi ’20, her Recruitment Co-Chair, was instrumental in reaching out to individuals who had submitted singing supplements with their Cornell applications. 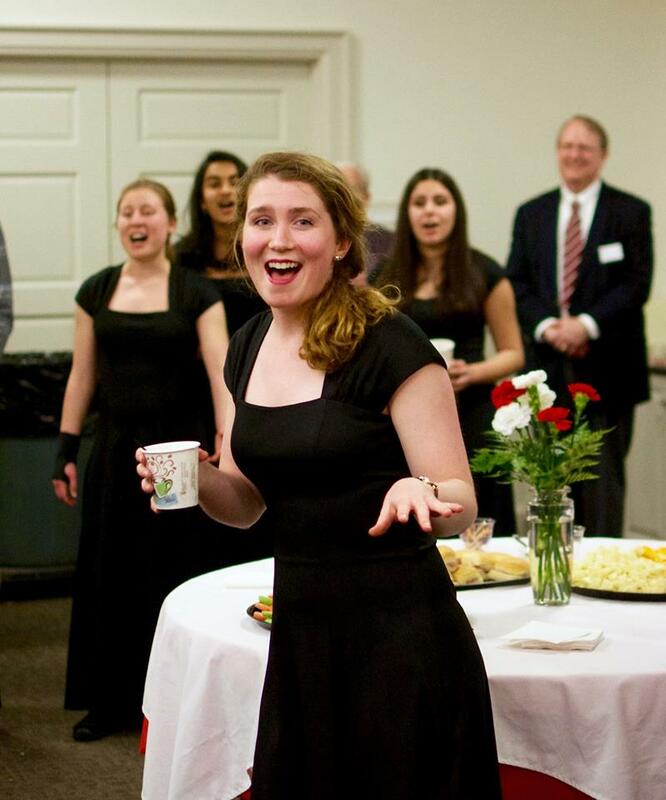 General Manager Autumn Watt ’19 spearheaded the creation of a collaborative website for all choral auditionees, aptly titled “Sing at Cornell.” It features videos, photographs, and audio clips of the Chorus, Glee Club, Chamber Singers, and Chorale. Social Media Chair Brianna Cox ’20 overhauled our social media presence to increase our connectivity and dialogue with other groups and potential auditionees. Vice President Amelia Pacht ’18 developed a case statement for our Endowment Drive as we head into its final stretch. I spoke with and appointed new members to our Advisory Council; congratulations and thank you to all our volunteers and councilmembers! Additionally, thank you for a fantastic June meeting. I continue to marvel at your efficiency, professionalism, and dedication. Our fall meeting, as a reminder, will take place on October 28th in the morning. That evening, the Chorus will perform our Twilight Concert. We hope many of you will join us for Cornell Songs at the end of the show, as well as for the reception immediately afterward. I am always excited to meet up with alumni, and have been lucky to meet so many at Reunions and other concerts over the past three years. That said, we are happy to see Chorus members of years past any day of the year. If you are ever in Ithaca, please reach out to us! There are enough members with meal plans that we can treat you to a delicious dinner on West Campus, grab coffee at CTB or at a library, unveil our rather newly-renovated Sage Basement, and more! We rehearse on Wednesday and Sunday evenings, if you can fit us into your schedules. Recently, hanging out with Kathy Heppner Trogolo was a special treat! As we head into this semester, the Chorus is particularly mindful of the concept of “home.” With natural disasters and legal turmoil creating uncertain futures for many students like ourselves, we aspire to create a home for our members and audiences both on and off the Hill.